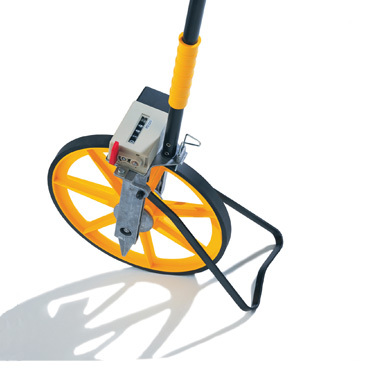 The Fisco Road-Meter is a robust measuring wheel designed for professional surveying, highway and site work. The high quality construction enables the wheel to withstand rigorous use whilst the high visibility yellow offers added safety for highway use. Tough, metal gearing and working parts for longevity. Clear reading counter mechanism displays metres and centimeters and is accurate to 0.1%. Easy to dismantle – swivel link folds sideways for quick collapse and packing. Integral dirt scraper which removes dirt to keep the wheel accurate. Easy to use foot operated brake which locks the wheel at the required measurement.